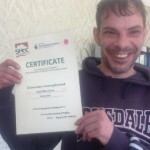 Graham came to us homeless, he is now settled in accommodation and has been getting help with his basic skills from a course in the Springboard Learning Centre. We’re all thrilled that he’s just completed the course and been awarded his first certificate. This is exactly what SHOC offers and Graham is a great example of the SHOC factor at work.